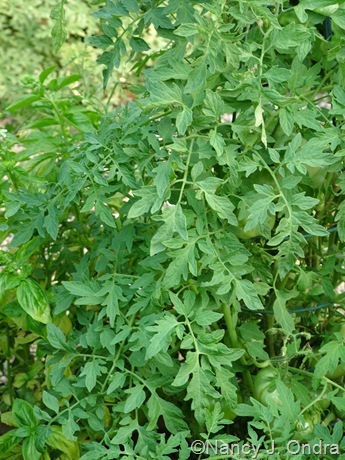 In the process of working on an article about tomato varieties, I ran across some really oddball heirlooms that sounded like must-trys: tomatoes grown more for their foliage interest than their fruits. The older leaves turn yellow. Uh, yeah – this is definitely not a variety with a wow factor. I should have paid attention to the unusually honest description from Victory Seeds’ catalog: “the plants look sickly.” Yep, they do. I found another site with a glowing description of ‘Lutescent’ that makes it sound like the most amazing ornamental plant you’ve ever seen. All I can say is that their seed strain must be very different. 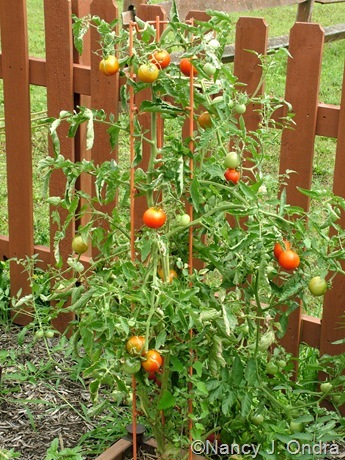 I definitely don’t recommend wasting garden space on this one unless you’re really bored with growing useful tomatoes. 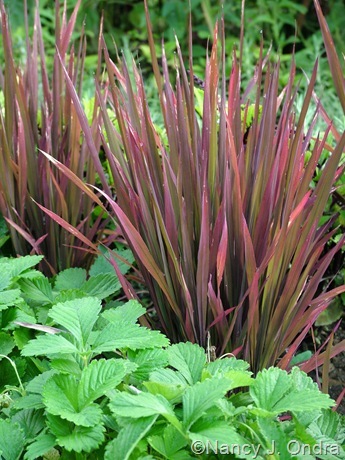 ‘Lutescent Long Red’ (above, also from Victory Seeds) has the same foliage trait, but it wasn’t that attractive or productive either. On a more positive note, ‘Mortgage Lifter’ (Pale Leaf Strain) was a very rewarding experiment. From the first true leaves, the seedlings were distinctly chartreuse. The foliage color was most obvious for the first 6 weeks or so. …especially when they began to set fruit. 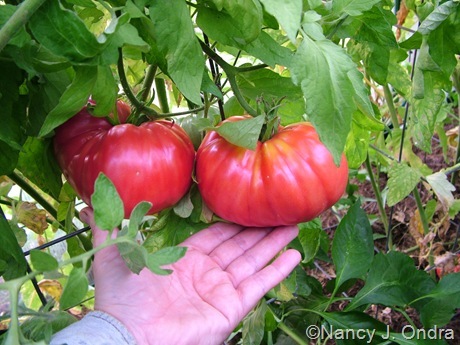 These tomatoes were fantastic: a beautiful pinkish red, huge, and well shaped, with a wonderful rich flavor. I’d definitely grow this one again. To round out the experiment, I revisited a few foliage varieties I had grown before. One was ‘Silvery Fir Tree’. As soon as the dark seeds sprout and produce the first true leaves, you can easily see how finely dissected the foliage is. The older leaves also have a light grayish cast to them. The determinate plants are quite handsome in leaf early on. And they’re also very pretty when their fruit starts to ripen. 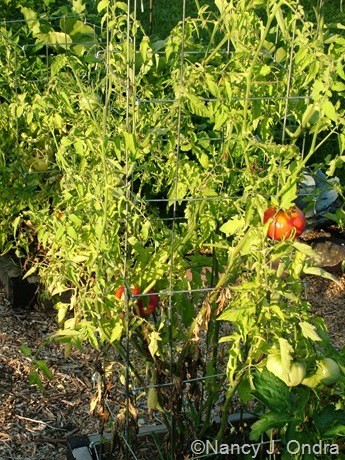 ‘Silvery Fir Tree’ tomatoes aren’t all that large, but they’re certainly abundant, and the flavor is average to good. Thanks to Mom, we have a lot of these put away in the freezer as stewed tomatoes for this winter. After their first big crop in early to mid-August, I trimmed the plants a bit, and they ended up producing another generous crop of fruit in September. Quite a few fruits matured and dropped before I got around to harvesting them, and I was already finding seedlings this fall, so I imagine I’ll have ‘Silvery Fir Tree’ growing again next year even if I don’t deliberately plant it. Wouldn’t be the worst thing I’ve had self-sow. 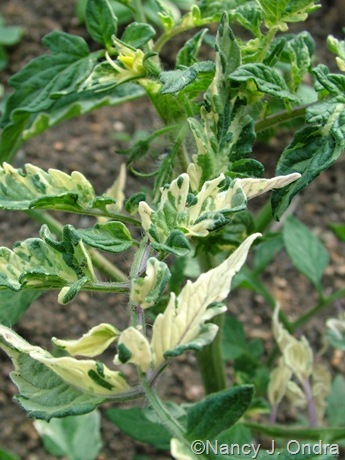 I couldn’t complete a collection of foliage tomatoes without my old friend ‘Variegated’ (also called ‘Variegata’). I planted this one years ago and usually find a few seedlings each spring, so it’s another one I normally don’t start indoors. But this year, I bought a packet of seed from Summer Hill Seeds to make sure I’d have plants for my informal tomato trial. 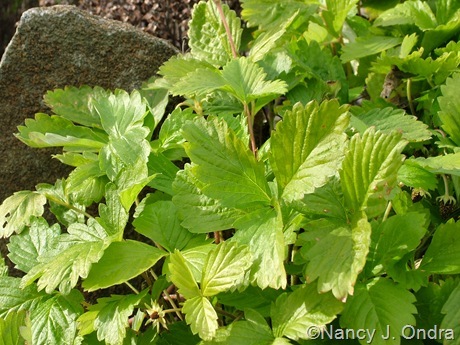 The cream-colored splashes show up at the seedling stage and are dramatic in early to midsummer. The foliage turns mostly green during the hottest part of the summer, then the markings show up again on the new growth in early fall. The vines are indeterminate, but the tennis ball-sized fruits aren’t that heavy, so the plants can perform all right with moderate support. Other years, I haven’t bothered picking many of the fruits because I thought the flavor wasn’t great, but they were tasty this year – maybe because I got a new seed strain or maybe because of the weather. One of my most exciting finds this year was a variegated volunteer that came up near where I grew the tiny-fruited variety ‘Spoon’ last year. I guess it’s possible that there was some cross-pollination with ‘Variegated’, but I’m inclined to think it was just a wonderful genetic fluke. 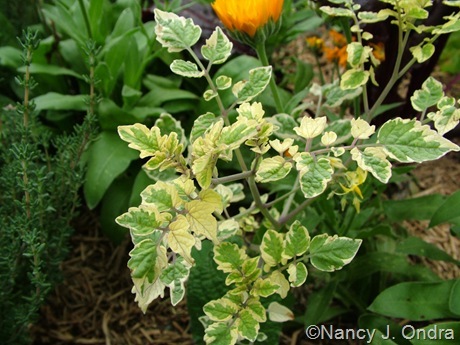 The markings are quite different than those of ‘Variegated’: they’re more concentrated along the leaf edges than random splashes, and they remained distinct even during intensely hot weather. 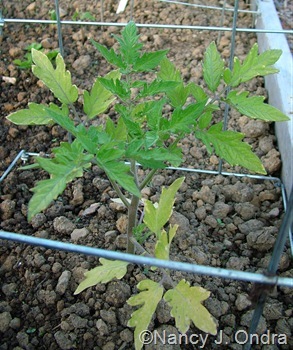 I really think this variegation could come true from seed, if I can get the seeds to ripen. 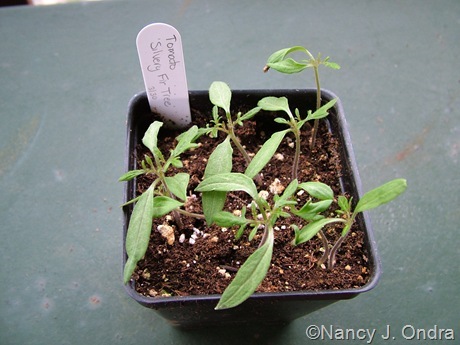 Because this was a volunteer seedling, it got a much later start than indoor-sown seedlings, and it didn’t even start flowering until early October. I ended up digging up the plant so I could keep it indoors at night and set it out in the sun during the day. 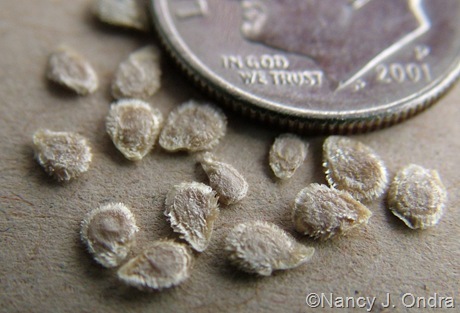 The fruits of ‘Spoon’ are barely the size of peas, and these are very small too, so I’m hoping they’ll mature quickly once they start changing color. Foliage tomatoes weren’t my only oddball-edibles experiment this season: I also tried out two different selections of alpine strawberry (Fragaria vesca). Well, technically this trial began last year, because that’s when I started the seeds, but this was the year I started harvesting from the plants. One is ‘White Soul’, available from Pinetree Garden Seeds and Underwood Gardens. I sowed them indoors in the third week of February and put the pots on a heat mat, and they sprouted in 2 weeks. 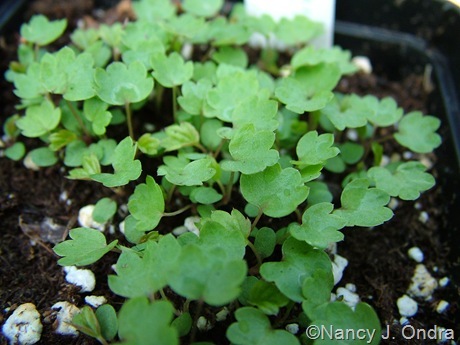 The seedlings below are just a month after sowing. That’s a lot of strawberry plants from one packet of seed – enough to edge a whole section of the Happy Garden with tidy-looking clumps of bright green foliage. The plants started blooming in May and are still flowering now, and they’ve been fruiting for most of that time. If you’ve ever had regular alpine strawberries, you know that the fruits are small but with an intensely rich strawberry flavor. These take that experience one step further: as the catalog descriptions promise, you really do get a mix of pineapple and strawberry flavor in the fruits. 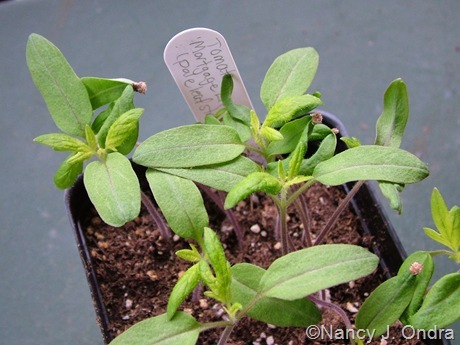 The other experiment was a chartreuse-leaved seed strain known as ‘Golden Alexandra’ – also sold as ‘Golden Alexandria’ – available from Plant World Seeds and Chiltern Seed. (Plants are available from Annie’s Annuals.) The foliage is very bright in the spring, green in the summer, and yellow again in fall (as shown above), in the same neat, non-running mounds as other alpines. ’Golden Alexandra’ produces red fruits that are about the same size as those of ‘White Soul’ (both shown above). Its flavor is as good as ordinary alpines, though not nearly as amazing as the white ones. 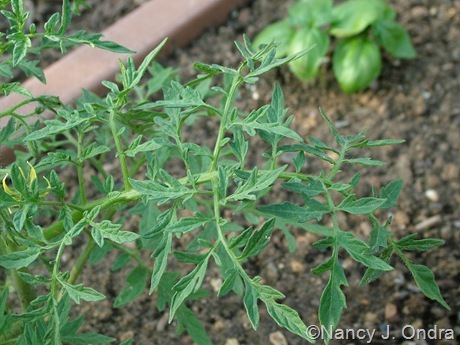 Both are fun to grow, but if you can only grow one, definitely give ‘White Soul’ a try. It’s not just a novelty: it’s a real taste treat. Great post. 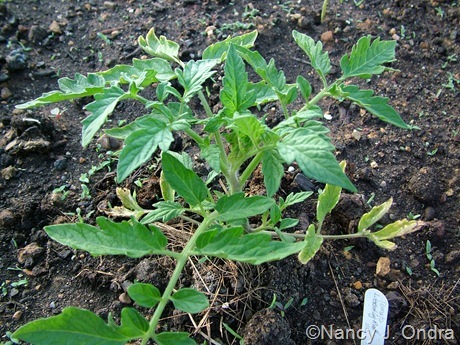 I love that variegated tomato volunteer. Hope you can get it to seed. I wish I had a warm greenhouse to keep it comfortable for just a few more weeks. But, so far, so good, anyway. Nan, a very interesting post. 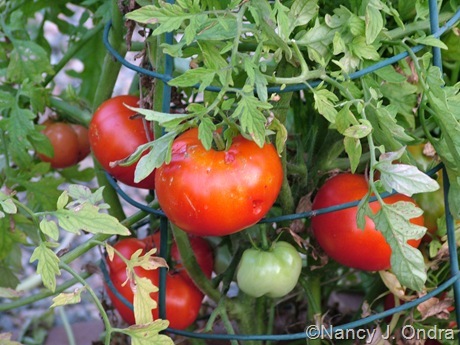 Tomatoes usually get blight here but I can’t resist a few plants each year. This year was the first time I got some fruits of my 6 plants, the last 4 years they have had blight. Because it is so hit and miss I grow the free seeds I get on magazines! 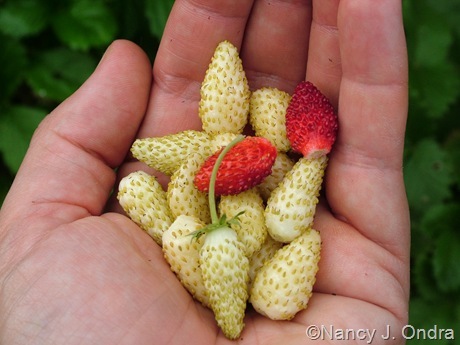 I also grow alpine strawberries from seed, my granddaughter loves looking for the fruit. I only managed to get one plant of Golden Alexandra to grow from seed but I hope for a few fruits next year, if it survives the slugs! 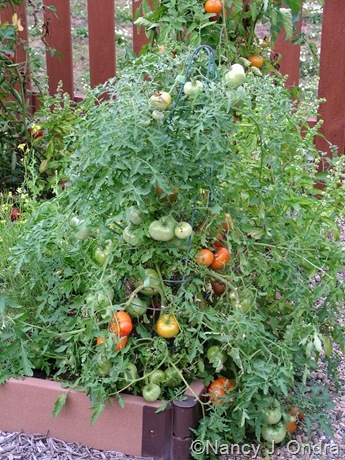 We had a disastrous tomato year last year, so I can sympathize with your challenges, Sylvia. I hope your ‘Golden Alexandra’ does well next year. I was so glad to see the strawberries here, Nan. I planted alpines from seed last year too, and bought a plant of the white recently. Happy to hear about the flavor, they seem so small. The plants grew well and should produce next year, I hope. There’s a lot to be said for the experience of biting into a huge, perfectly ripe “normal” strawberry, and compared to the monsters at the grocery store, the alpine fruits do look puny. But oh, they’re definitely worth growing. You won’t be making any substantial desserts with them, but they’re great on cereal or in fruit salads – *if* you can manage to resist eating them right in the garden. Agree with the commenter above! I love the idea of variegated veggies. Question: do you think ‘Alexandra’ would be gold in a bit of shade? I tried direct-sowing seeds of it this year with no luck. The spot I wanted to grow them is shady, so I’m trying to decide if it’s worth another try. I definitely think they’re worth another try, Andrew. I’ve had alpines self-sow, but the seeds are so small that I think they benefit from some pampering indoors to get off to a good start. I’ve heard that the color is still good in shade, though I’m guessing that the plants would still be greenish in summer. Maybe you can let us know. 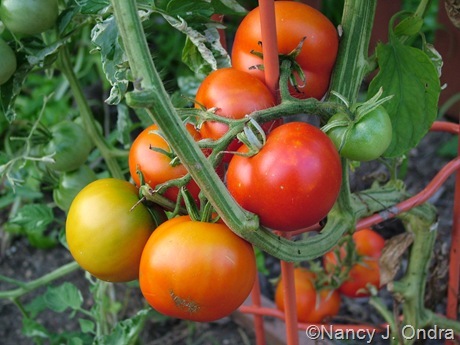 I started out 35 years ago as a vegetable gardener and grew dozens of varieties of tomatoes. We even had blind taste tests. I never thought of growing them for their leaves (or really even looking at their leaves). Some of the plants you highlighted are quite distinct and beautiful. Unfortunately, as the shade grew and the deer multiplied, I can only grow a few favorites now like ‘Brandywine’ and ‘Sweet 100’ cherries. Thanks for keeping everyone’s eyes on heirlooms. Hey there, Carolyn. The two you mentioned are some of my favorites too. When I grow oddballs like these foliage varieties, I’m reminded that there’s a good reason some unusual plants *are* unusual. But it’s fun to experiment with them now and then. Oooh… I’m beyond intrigued by some of these! 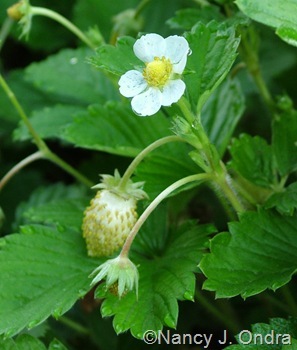 So, I have to ask: How do you know when those ‘White Soul’ strawberries are ripe? That’s an excellent question, Kim! I basically go by the size and the plump shape. 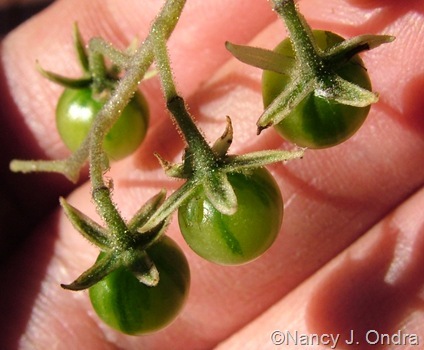 The fruits also slip off the calyx much more easily when they’re ripe. 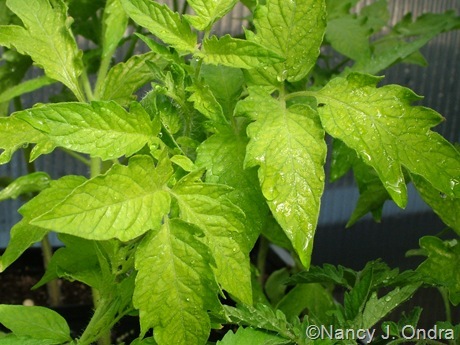 That variegated ‘Spoon’ tomato is ornamental enough to be a houseplant. 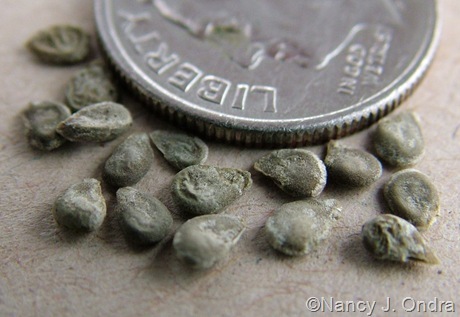 Do you always take pictures of your seeds before you sow them? 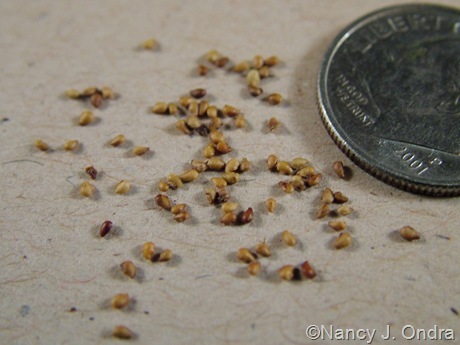 I started taking seed and seedlings pics a few years ago. I also took pre-planting pictures of loads of bulbs this fall. I figure they might come in handy someday; we’ll see.